As a kid, I never liked brown rice and I would dread the trips to our ancestral home in Mangalore since they did not serve any white rice. I do remember throwing a fair amount of tantrums before every meal because I didn’t want to eat brown rice. Fast forward like 30 years later, I have become a huge fan of brown rice, though I don’t eat the polished rice a lot. 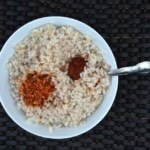 During my recent trip to Mangalore, I got some brown rice to introduce it to my kids. I was not sure, how they will react but was hoping for a better reaction than I gave my mother. Instead of draining the water after the rice is cooked, I decided to make some Ganji for them with this brown rice. 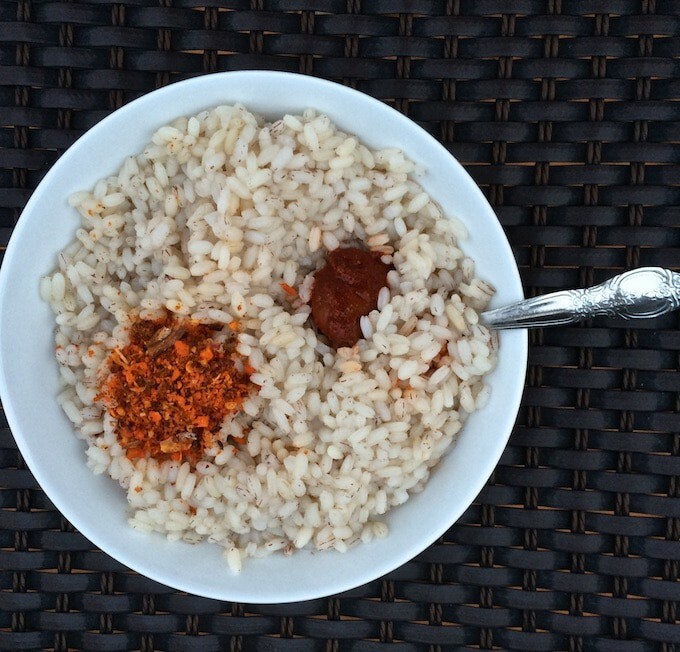 Ganji is made by cooking brown rice or oorpel ari as they call in Mangalore in large amounts of water till the rice has softened significantly and some starchy water remains which is called as Teli. This Teli is considered to be highly nutritious and often serves as food for those who are sick and babies since it is highly digestible. Ganji is best served with meen (fish) chutney and mudi uppad ( pickle) and if you want to go all the way – a dollop of ghee would be even better. Accompaniments - ghee, pickle, fish chutney etc. Pressure cook the rice with water on medium heat and salt till the vent goes off twice. Lower the heat to a simmer and continue to cook for another 5 minutes. Take the cooker off heat and let it cool down before opening the lid. Serve the Ganji hot with the desired accompaniments.